Cocktails and Canvas At Cypress Tavern in Kinnelon NJ | Eat. Paint. Love. Join us for a fun night out of painting at Cypress Tavern!!! 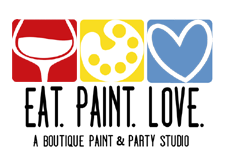 We will walk you through a 1.5-2 hour paint class taught by a professional & FUN artist. Please arrive promptly for your session You will be painting on a 11×15″ wood sign – with guided instruction. Seats must be reserved ahead of time by registering and paying on our website. No EXPERIENCE NECESSARY. Any age can attend but will be an adult atmosphere. Must be 21 years or older to drink. We will provide you with everything you need from supplies to instruction + LOTS OF FUN! WE DO NOT ISSUE REFUND UNDER ANY CIRCUMSTANCE.